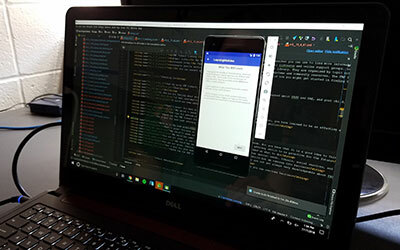 Jordan Floyd ’20, an electrical and computer engineering major, was not familiar with developing Android apps before starting her research project this summer. Now, she’s using Java and Android Studio to construct learning modules for an interactive app. 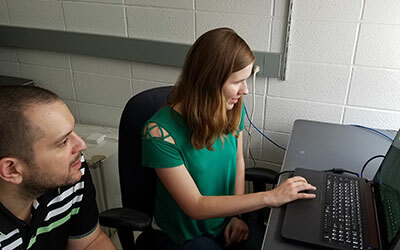 Her mentor Cristiano Tapparello, a research associate in electrical and computer engineering, is developing a healthcare app in partnership with Christie Petrenko, at the University’s Mt. Hope Family Center. The app aims to provide health information for self-directed and peer-to-peer interventions for parents and caregivers of children with fetal alcohol spectrum disorders (FASD). Floyd used content derived from the Families Moving Forward program, which contains information and questions for caregivers, to program the educational component of the app. She also worked on organizing content from the app so it can be easily placed and retrieved from a database. Floyd and her mentor Cristiano Tapparello, discuss Jordan's project. Floyd is gaining more research experience and learning the basics of developing an app. She enjoys the collaboration with professors, fellow students, and clinical professionals. It has fed her interest in the intersection of health and technology. Floyd says she was surprised at how much community building there is within the different Kearns programs. Along with Xerox Scholars, the Kearns Center also hosts McNair Fellows and NSF/REU scholars over the summer. All of these students conduct research in partnership with staff and faculty mentors on campus, and have events and social activities together. Both the McNair and NSF REU programs host students from institutions outside of the University of Rochester, too. Floyd says it has been nice to meet students from other majors and universities, all doing research here this summer. Floyd works in Android Studio. 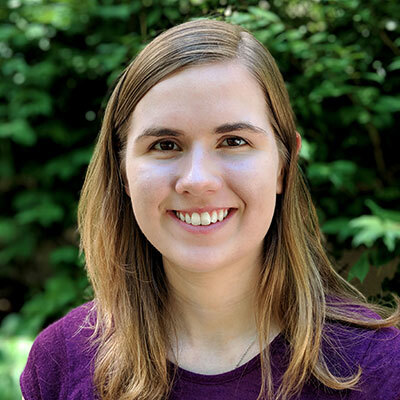 Tapparello, her mentor, is participating in the Xerox program because he enjoys guiding students through their first hands-on research experiences. He believes that, “no matter if they ‘finish’ a project, my students will learn something from their summer research.” He says Floyd has been a fast learner, and they’ve been talking about making this a longer-term project. Floyd, for her part, says that she felt pretty challenged at first because she had never worked in Android Studio before. Now, with practice, she knows how to navigate the program and build a functional app.